We placed the skillet over a hot burner to get it good and hot and to set the bottom of the crust. Once the crust began to brown, we simply slid the skillet into a 500-F oven. In the oven, the hot skillet functioned like a pizza stone, crisping up our crust in just minutes and melting the cheese. 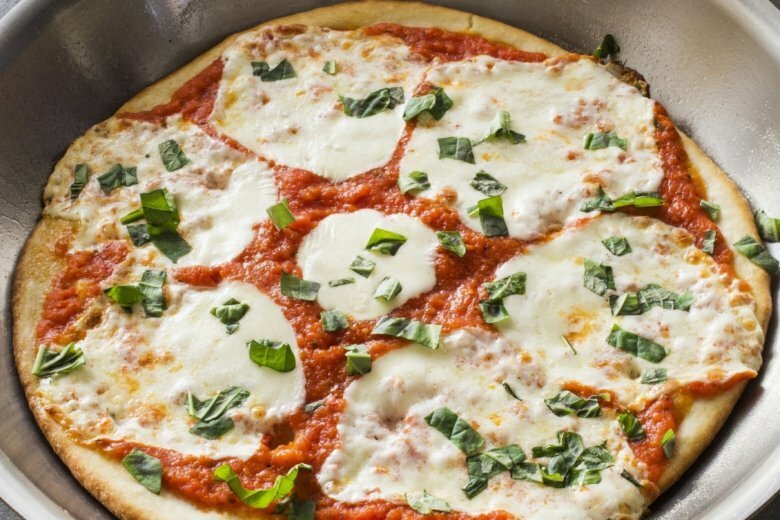 We’ve featured a Margherita pizza topping here, adorning the sauce and cheese with just a sprinkle of basil. But if you’d like a more substantial topping for your pizza, feel free to sprinkle pepperoni, sauteed mushrooms, or browned sausage over the cheese before baking; just be sure to keep the toppings light or they may weigh down the thin crust and make it soggy. For the sauce and toppings: Process tomatoes, 1 tablespoon oil, garlic, vinegar, oregano, salt, and pepper in clean, dry workbowl until smooth, about 30 seconds. Transfer mixture to 2-cup liquid measuring cup and add reserved tomato juice until sauce measures 2 cups. Reserve 1 cup sauce; set aside remaining sauce for another use. Transfer skillet to oven and bake pizza until edges are brown and cheese is melted and spotty brown, 7 to 10 minutes. Using potholders, remove skillet from oven and slide pizza onto wire rack; let cool slightly. Sprinkle with 1 tablespoon basil, cut into wedges, and serve. Being careful of hot skillet, repeat with remaining oil, dough, 1/2 cup sauce, remaining mozzarella, and basil. Nutrition information per serving: 322 calories; 152 calories from fat; 17 g fat (5 g saturated; 0 g trans fats); 20 mg cholesterol; 657 mg sodium; 30 g carbohydrate; 2 g fiber; 3 g sugar; 10 g protein.